Last week, I joined host Dylan Fields from Man I Love Films, Fogs of Fogs' Movie Reviews, and Joel Burman of Deny Everything for the latest episode of the LAMBcast. 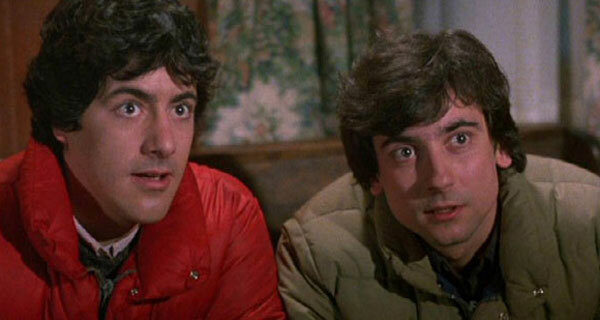 The topic was An American Werewolf in London, the 1981 horror comedy from John Landis. It's an interesting film that works 30 years later because of its offbeat sense of humor. Landis excels at this type of comedy, which doesn't feel locked into a certain time period. The highlight is definitely the special effects from Rick Baker, particularly during the stunning transformation sequence. There's no way this type of scene could work so well with computer animation. David Naughton plays the lead role of David Kessler, who's backpacking through England with his buddy Jack (Griffin Dunne) when they're attacked by a vicious creature. Following this encounter, David starts changing into something that isn't human. He also begins a relationship with Nurse Price (Jenny Agutter), but this happiness may be short-lived. For more details, check out the LAMBcast and let me know what you think!